For the first time that i can remember, Antigua media have gone bananas for ground swell coverage. You would have thought we never have had ground swells before. I keep hearing people say that we have never had swells like this before, but i think they probably should be saying they have never seen swells like these before. 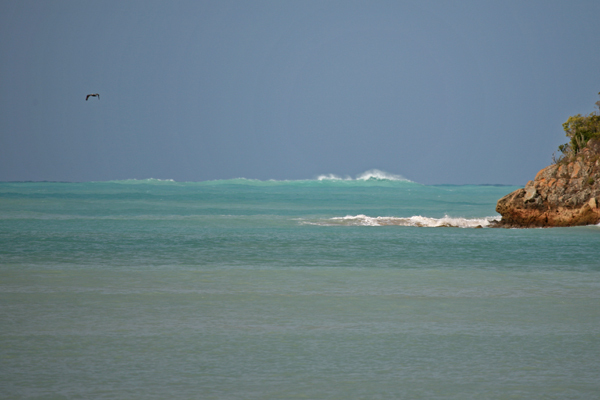 Don't get me wrong, the waves were big, but i remember seeing ground swell like before. The strange thing about this ground swell event was not only the size, and the period, but how long they have stuck around. 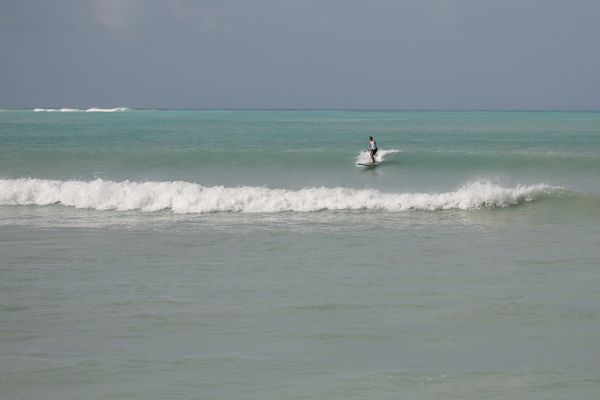 We are still getting good surfing conditions here several days after they started. Anyway, i am glad that the press here went nuts on the news of these swells because finally fishermen and pleasure boaters got the message. What the met office and the media should do here is keep checking www.windguru.com. Predicting weather events here is as simple as that. Here are a few pics of Nik B. just before i got in to enjoy some of the swell which didn't have too much norh wind on it. 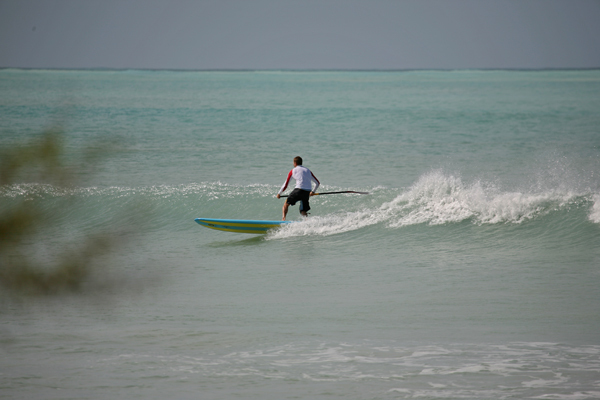 Most of the "prone" surfers didn't get perfect enough waves with the winds that were making the surf lumpy, but the SUP guys were loving it. It looks as though there is going to be some massive swells passing through the Caribbean next week starting here in Antigua late Tuesday probably. For anyone who knows fishermen and or others keeping their boats anchored close to shore on the west and north coasts please warn them. Windguru and magicseaweed say waves up to 15 feet on wednesday. - 27 knots on windguru???? wow, windguru doesn't like to say its going to get over 25 knots that often in the Eastern Caribbean. I have been following their forecasts for years and this wednesday is looking like a weather event with winds up to 27 knots and seas of 3.8 meters!!! WOW. 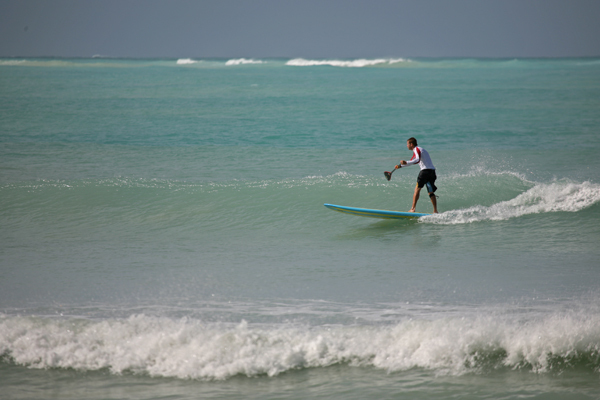 I have to find that small windsurfing gear once again and dust of my wave board. The only fun on the water on wednesday if this forecast continues is on a very small windsurfing wave board with a small sail. Anchor your boats properly. hard to understand how a lightning stike could have done all this, but it was a sad day for yachting in the caribbean yesterday. 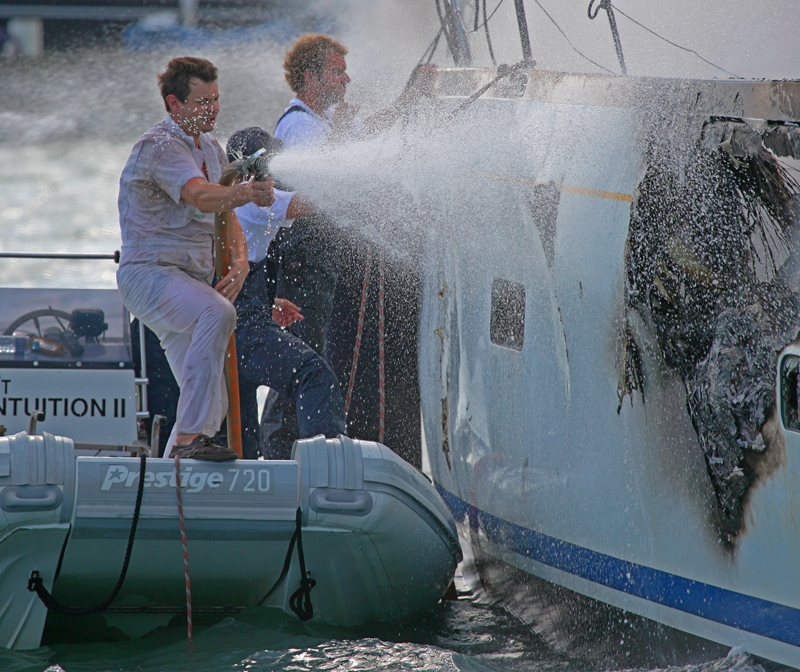 so much more could have been done to prevent the total loss of this yacht. i am sure there will be much debate about it. The sun came back yesterday but there was still the occasional shower. The temperature dropped quite a bit and the wind was a bit on the nippy side. This morning is a little brighter/sunnier but quite a few clouds hanging around so I would expect an occasional shower in between the sunshine. We awoke to a dark and rainy day, with occasional lightning followed by thunder. At least one school so far is not opening due to the inclement weather. I just heard a pretty bad roll of thunder from inside our building. There was very little traffic on the road at 7:30AM, seems like everyone is struggling to crawl out of bed. The GUA radar site shows it to be localized over Antigua, Guadeloupe and Montserrat, at least the heavy bits. - weird... i didn't say FIRE! in the title of my last post i omitted the "FIRE" bit of bob marley's song because it was just lightning brimstone and thunder outside..... or so i thought. 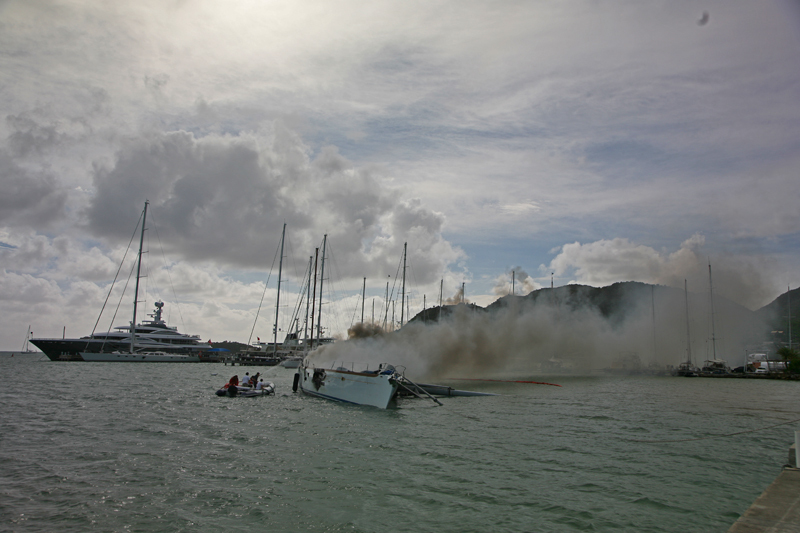 a big yacht was hit by lightning at the Cat Club and was on fire a short while ago. They quickly pulled her into a well at the marina and the fire trucks were fighting it. talk about CRAZY WEATHER! I dont think we have had 12 hours of solid rain like this in ages and ages. The radar shows heavier rains than i remember seeing too. Sat loops show it passing out pretty soon though, which will mean i wont have to cancel more trips tomorrow. I didn't mind too much today because it feels and sounds pretty good this am. From a weather point of view, we have been having an unusually amount of rain for this year. December and now January are usually pretty dry. I think it has rained almost every day for the past week at least, off and on. Some of the showers are quite heavy although only in spurts. In checking another Wx site today, there is a tropical cyclone ELNU between Madagascar and Africa. I can't think of any time where I had seen such activity. So 08 has started off with some unusual occurrences for us and now Africa. Add to that an unusually dry year for the Southern USA. Things aren't going to be the same this year. This morning the sky was almost cloudless. A bit on the nippy side (for us) but it is gong to be a stunner for those lucky or unlucky enough to be outdoors. Seasons greetings all around. Older reports from Antigua have been moved to another page.